Use automated analytics that are closely aligned with overall business objectives and supported by mature processes to stay ahead of the game. This forms a hierarchy that yields incremental improvements where each sub discipline builds upon the capabilities provided by the level preceding it. The more effort you put in, the more valuable intelligence you will gain. To truly optimize your services, it’s not enough to focus on just data analytics. Experience the full effect from your analytical efforts by combining them with gradually refined processes and skills within your organization. Our IT Service Optimization Maturity Model offers a step-by-step road map that ensures a balanced approach where each maturity level feeds off the capabilities introduced on the levels below it. At this level of maturity it’s the lack of purpose that stands out the most. You are missing a consistent strategy for managing and improving the quality of your services. Why Are You at This Level? Any effort to improve service quality is usually triggered by incidents, brought to your attention by users or customers complaining. Resolving the issue often becomes a personal task assigned to individuals with the proper skills. However, relying on heroic contributions from individuals does not lead to the consistent, sustainable improvements desired by the business. Access to empirical data about how the different components and layers of the infrastructure are being used, now and in the past, is a requirement for improved service quality. With technology trends like virtualization and software defined data centers, the number of components and their interdependencies has increased dramatically—and is constantly changing. If you only have access to data for a subset of those components and limited understanding of how they fit together, any optimization effort becomes a complete hit and miss exercise. Since IT service optimization takes a conscious effort, operating at this level will not lead to any significant or repeatable improvement in your ability to deliver services efficiently. You will remain a victim to “unknown” circumstances and unexpected events until you make an effort to increase your maturity. 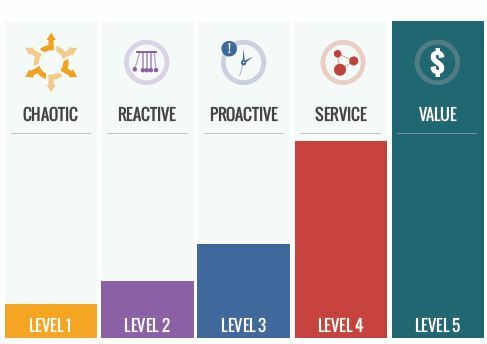 Moving up to the Reactive level is primarily about improving your ability to react to events in your environment in a consistent and timely fashion, but also about ensuring that you have enough information to allow for proper handling of those events. How Do You Get to This Level? The first step is to make sure you have access to detailed information about the behavior of the components underpinning your services. Ideally that data should be available from a single source, but in reality you will probably have to use multiple different data sources (due to differing tools or technology silos). The use of descriptive analytics, designed to monitor components and send alerts based on predefined thresholds, improves your ability to make timely identification and quick mitigation of incidents. This systematic analysis of incoming data, expanded to include an increased number of components and data sources, will also put focus on the need to automate most of the activities. Automation of the analytical capabilities will help you improve efficiency in terms of staffing and will lead to more consistent and repeatable procedures. Automation simply becomes a requirement for keeping up with the pace at which data is being produced. Ongoing systematic analysis of incoming data will allow you to react faster to incidents in your operating environment. This increased focus on faster problem detection and resolution will have a positive impact on the quality of your services and will contribute to increased availability. You will also get a better understanding of how the existing infrastructure is being utilized at a component level, allowing you to correctly address cases of under- or over-provisioning. What Can Still Be Improved? Having access to real time component-level data will only take you so far, because you will not be able to predict recurring incidents. As a result, you are still spending most of your time reacting to things, rather than trying to identify and eliminate the root cause. You will continue to deal with the same amount of incidents, only at a higher speed. Another area of improvement is around the strict focus on technical components. Without understanding the context surrounding services that are currently making use of a component, it’s hard to properly prioritize incidents in order of importance to the business. Overall service quality is really what you should focus on, limiting yourself to a narrow component view will lead to misdirected efforts. You have already developed an ability to efficiently react to events. Taking the next step involves discovering patterns among those events and “learning” from the empirical data you have available. Once you master that, you will be able to proactively mitigate risks before they have a negative impact on your services. This also has the potential of raising overall efficiency, but more about that later. Aggregating and retaining selected portions of the data you are collecting will allow you to do more advanced analysis of that data. You can use diagnostic analytics to discover the root cause of incidents, find recurring patterns or spot historic trends. All this allows you to become much more proactive and increases your ability to identify and prevent some incidents before they happen. As you start involving more advanced analytics, you will also discover the need to improve the integration of different data sources. The ability to automatically analyze and correlate data across technical or organizational silos will allow you to find new and unexpected dependencies. In addition to just analyzing data pertaining to services and technical infrastructure components, you should expand the effort to include more peripheral sources that can improve your optimization efforts. Any and all of these has the potential of improving your analytical effort. The term integration does not necessarily mean physical consolidation of the data, which leads to hosting redundant data. Solutions offering integration through federation make multiple sources appear as a single entity without consolidation. Once you have integrated the different data sources, it may be tempting to unleash your analytical capabilities across the whole environment. But in reality there is probably a subset of comparisons that are more relevant than others. To identify which those are, you should look to data sources like Configuration Management Databases and Service Catalogs for guidance. Asking questions like “Which components are used by service X?” or “What are the likely downstream effects of component Y getting saturated?” will allow you to limit the scope, focus your efforts and get quicker results. It will also allow you to prioritize actions based on the importance of the service impacted and communicate the results of your effort in terms that make sense to your customers. Adopting a more proactive optimization strategy will lead to improved efficiency. A better understanding of priorities, component dependencies and forecasted future behavior based on historical trends will build your confidence and allow you to increase the utilization of individual components. By systematically “sweating” your assets harder, you can defer or altogether avoid investments in new capacity resulting in overall improved efficiency. More advanced analytics intelligently applied to your collective data will also increase your ability to proactively avoid incidents and further improve the quality of your services further. Operating at the Proactive level means that you will have gained some ability to forecast and react to events that will happen in the near future. But these predictions are based on extrapolation of past behavior and may therefore lack in general applicability. Scenarios with a longer planning horizon or scenarios involving non-linear growth caused by outside factors not represented in past behavior are still a major challenge to predict accurately. Another weakness is that most of the analysis is based on comparisons against predefined thresholds. Unless you use thresholds that are specifically tailored for each individual component or service (which is virtually impossible in an environment of any reasonable size), the conclusions may not be relevant. Creating indicators of service health based on response times and latency will address this. So far, any planning and proactive measures have been based on extrapolation of trends in historic data. But there are more powerful and accurate ways of making predictions, especially if the scenarios involve nonlinear growth or simultaneous changes to multiple components. By employing the next level of analytics, you can accurately predict the outcome of such scenarios and offer powerful service quality indicators. The traditional approach has been to perform this type of analysis only for selected services, generally the ones most important to the business. Before you start crunching the data, engage with stakeholders in various parts of the business to define scenarios that are relevant and realistic. Building those relationships outside of IT is crucial and while this will be a process with a lot of manual steps involved, it has the potential to greatly improve the efficiency and quality of the identified services if done correctly. But sometimes the above strategy is simply not attainable. You may not have access to people that can define the relevant scenarios. Or your services may be underpinned by a highly dynamic infrastructure, leading to constantly shifting configurations (making assessments based on a snapshot irrelevant). Or maybe the sheer size of your operation in relation to your staffing resources makes it impossible to accomplish. build that capability already at the Reactive level), you can afford to run this across all your services. This will provide a thorough assessment of service health and the possibility to predict which services will be in a state of “noncompliance” based on the evaluated scenario. This kind of macro-level predictive analytics approach, where you can focus on the exceptions, will allow you to extend the reach of your optimization efforts and cover a fairly large scope with a reasonable effort. Starting out with a wide and automated standard assessment, you can then drill down into services that stand out only when needed. A focus on making more accurate predictions, either based on manually crafted scenarios covering individual services or in the shape of a wide assessment aimed at identifying outliers, will greatly improve your ability to plan ahead. A good understanding of when a service will need additional resources will allow you to make just-in-time investments and stay closer to the true capacity need. These insights will also allow you to start impacting the demand for a service. Rather than strictly focusing on the supply of capacity, you can look for ways to optimize and influence how resources are being consumed. 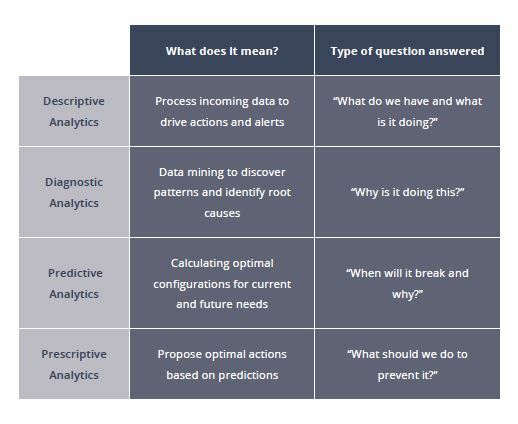 By using predictive analytics you can answer a question like, “How will this scenario impact my ability to continue to support the business?” If the conclusion is that your ability is impacted, the analysis will likely give some hints as to what actions are needed to maintain the desired service level. The next level of maturity is about developing a capability to automatically rank and prescribe actions in response to predicted events. To reach this maturity level, you should leverage the decision support produced at the lower levels into an ability to suggest decision options on how to take advantage of a future opportunity or mitigate future risk. The suggested actions should of course be aligned with your overall business objectives. The Value level is characterized by an increased focus on business alignment. Along with the increased maturity, you will gradually move away from the role of being just the expert that solves intricate technical problems and will now be ready to take the final steps towards offering comprehensive decision support that is aligned with the business objectives of your organization. In more direct terms, this means adding an ability to continuously optimize your operation through proactive automated actions. In addition to predicting the timing and consequences of a forecasted scenario, prescriptive analytics will help you find the optimal action for dealing with those consequences. If the result is a number of different options, they need to be ranked in order of feasibility and alignment with business objectives. The definition of business objectives and a set of rules for how to relate them to concrete actions becomes a key ability. The increased understanding of business objectives and how they relate to your services will also allow you to do better service valuation. Service cost can be weighed against the business benefits. Using that relationship as input to your optimization efforts (together with the ever so important business objectives) will allow you to prioritize and focus your actions even further. By analyzing a set of scenarios, you can then propose actions that will lead to further optimization, providing answers to questions like “How can we do this better?” How the actions get carried out is normally a matter of scale. High impact actions requiring thorough planning may remain manual. But smaller corrective actions aimed at continuous service improvement should be automated. Throughout, all services will be optimized to offer maximum value to the business. Even though the highest level of IT service optimization maturity has been reached, there is a continuous need to analyze and realign your processes to changes in the business needs. The concept of IT service optimization is often associated with increased efficiency and reduced risk, two forces that will drive valuable improvements. But without a full understanding of the business objectives and how IT needs to be aligned with those, full optimization is not possible. The IT Service Optimization Maturity Model will allow you to gradually improve without losing track of any important aspect. Ready to see how Vityl Capacity Management can help improve your IT organizations maturity level? Get your free personalized demo today. We'll walk you through the software's capabilities, showing you what Vityl can do for your organization.